KAHUKU IS out to prove that it's not a two-person show in this year's postseason. But even if the Lady Raiders can't, that might not be all that bad -- guards Artevia Wily and Camilla Ah-Hoy have been punishing their opponents all season long. Oahu Interscholastic Association foes have come to expect that the Lady Raiders' loaded backcourt will do the brunt of the damage. Sometimes it's enough, and sometimes it isn't. The challenge for Kahuku (8-4 OIA regular season) has been maximizing the team's scoring output for everyone else. Wily (17.9 points per game) and Ah-Hoy (13.4) have combined for more than half of their team's points in six OIA games, and have come close to it in most of the rest. Whether their teammates are able to step it up, Wily and Ah-Hoy have been deadly with a two-guard game. That's mainly because the two have an uncanny knack for finding each other on the floor for scores or setup passes -- without talking. "The two of them, without anybody else telling them, look for each other on the floor and they work really well together," said Kahuku coach Val Anae. "That's always nice to have when your two best players are so compatible. There's never, ever been a thing where one says 'I need to score' or this type of thing. If one's had more points or whatever, they've been very supportive of each other." While this works just great, it has led to another problem. Even if Wily and Ah-Hoy are on the same page, the rest of the Lady Raiders may not be. So they've been working on their team's communication on the court. "WE'VE BEEN TRYING to work on (Wily and Ah-Hoy) talking on defense and offense, and only now they're starting to say stuff," Anae said. "(Sometimes) they don't even talk and they just look at each other and they have this connection." Go figure; the two senior team captains are distant cousins. It also helped that they've played together in Police Activities League games since they were little, and were both starting freshmen three years ago. "My relationship with 'Tavy' is different than the other girls on the court," Ah-Hoy said. "She knows me way better than everybody else. "She understands me better than I do," she added with a laugh. 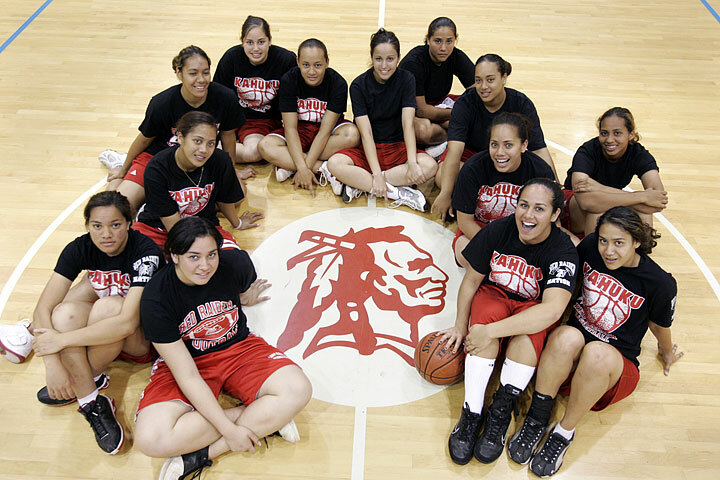 Guards Artevia Wily and Camilla Ah-Hoy and the rest of the Red Raiders are focusing on the OIA championship tournament that starts today. "I can just look at (Ah-Hoy) and she'll look at me and she'll know where to go," said Wily. "If I look at someone else, it's not as easy. She's quick and everything, (and) I guess it helps that we've been playing for so long. It's easier to tell where to throw the ball." Even though the two share a bond on the court and are usually silent, they have contrasting styles. "They're both really, really intense, but Tavy's (demeanor) is more like 'I'm gonna get you,' " Anae said. "Milla is more 'I'm gonna get you, but it's a nice way.' "
WHEN EITHER CAPTAIN takes the time to speak up to teammates in a huddle or at practice, though, it has a greater effect because of how seldom they do it. Wily focuses on the sport year-round, and it tends to show in the box scores. She's topped 20 points five times this OIA season, and her season-high is 29 at Kalaheo. Wily grew up with basketball -- her older sister, Latoya, is a sophomore forward at Alcorn State University in Mississippi. Before each game, little sister consults big sister for strategy. "She's a hard worker and a good leader, and she calls me every day before my games," Wily said. "She tells me what to do and gives me motivation and advice for my game, so she really helps a lot." Despite the fact that there is a dip in pure talent after the top two players on the team, Wily and Ah-Hoy don't let themselves get mad at their teammates after a bad play. "One of the games, against Kaiser, (Tavy) got frustrated at all of us because some of us aren't up to her level," Ah-Hoy said. "So we were trying to talk to her to help us play to her level. Ever since then, she's been really good about it. She's not really a vocal leader, but she leads in action, like the way she plays. I think both of us are like that." "We don't get down on the team, try to just motivate them and help them," she said. "Like if they made a mistake, just tell them 'stay positive, we'll get it back next time.' "
ANAE REALIZES she has to get contributions from most of her team in order to be successful in the postseason. "There was a big gap (after the two) at the beginning of the season," Anae said. "But since then we've been getting five or six players outside of them to score and score well for us. I expect big things from the other three starters and the other four or five players off the bench, and I expect them to score five to eight points because they're capable of doing it." Ah-Hoy deftly handled a recent switch to point guard at the request of Anae, who desired more rebounding at the position. Wily switched over to shooting guard. Ah-Hoy is a volleyball player first and basketball player second. She's accepted a full scholarship to play volleyball at Oregon State next year and carries a 3.7 grade-point average. She is primarily a setter when she plays volleyball, so running a team's offense is nothing new to her. "A lot of people are expecting me to be at the top, taking the ball down, so we just wanted to switch it up and see what (opponents) do," Wily said. No matter where on the floor the two play, though, they know their opponents' defense is going to key in on them. When they play against Roosevelt today in the OIA semifinals, the Lady Raiders' success hinges on the play of its guards. In two losses to the Rough Riders so far this season, Wily and Ah-Hoy were held to a combined average of 24.5 points. "We need to be focused and mentally prepared for them," Wily said. 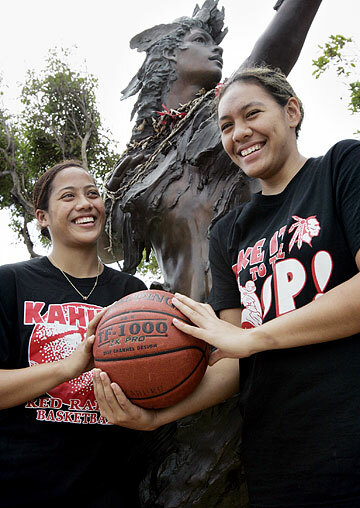 When it comes to Kahuku's backcourt, there is little doubt of that.